Q. What is the contact information for the inn? Q. Do you have free on-site parking? A. Yes, one space per room. Q. What are check-in, check-out times? A. Check-in is 3:00-6:00 PM; check-out 11:00 AM. Q. Do you offer early check-in / late check-out? A. Whenever we can, we do by request. Keep in mind we are a small property and each room/suite is unique, so another guest before or after you may limit our ability to accommodate your request. Even if we cannot extend your room stay, we can usually accommodate your car and luggage so you can walk around town and enjoy. Q. Can you accommodate a late arrival? A. Sure, as long as we know in advance. Just email us or call. If you are arriving after 6, we can provide information so that you can get into the inn and into your room. We will check you informally the next day. Q. What is within walking distance of the Inn? A. Almost anything downtown St. Petersburg has to offer – dozens of restaurants, waterfront parks, museums, nightlife, theatre, movies, even shuffleboard. Q. 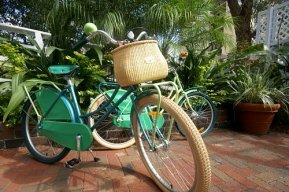 Does the Inn have bikes we can use? A. Yes, though we will ask you to sign a waiver. Q. Does the Inn have a guitar I can play? A. Yes, as long as you don’t break it, or sound bad. A. Dawn to dusk. Please remember many of our guests come here for a quiet stay, so try not to sound like you are having more fun than everyone else. Q. Do you have weekly or monthly rates? A. 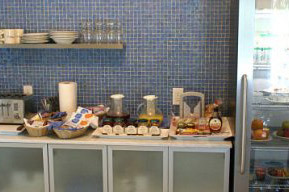 We will be happy to quote you a rate for an extended stay, or for a group needing multiple rooms. Q. What do you serve for breakfast? We usually have a selection of cereals and oatmeal, fresh fruits and juice, milk, yogurt, hard boiled eggs, bagels, bread, sweet rolls, cream cheese, jams, and peanut butter. On weekends and busy times we add a hot dish at around 8 am. Coffee and tea, of course, as well as made to order espresso drinks. Q. What if I am picky and would like something special? A. Just let us know ahead of time and we will try to accommodate you, as long as it doesn’t involve cooking. We’re great at making coffee drinks, but we aren’t cooks. Q. 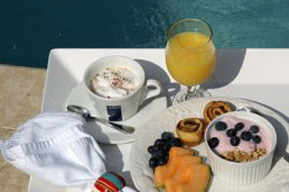 Does the dining room open to the pool so I can have breakfast by the pool? A. Of course, you are in Florida. Q. What are office hours? A. We don’t have official office hours, so please call us if you need anything or are checking in. A. We have a ramp from our parking lot to the main floor. Manatee is an accessible room with a roll-in shower on the main floor. There is no elevator, so upper floor rooms require climbing stairs. The Lighthouse suite requires going up another set of stairs, but the reward is you have the whole 3rd floor to yourselves. Q. I keep hearing these voices in my head, what’s up with that? A. You are obviously on the wrong site, you should be looking for one of those chain hotels that charge for parking and don’t even have water spouts in their pool.